RAF Ludford Magna Airfield in Lincolnshire, was build south of the twin villages of Ludford Parva and Ludford Magna and was one of many airfields build in the early 1940s as part of Britain's war effort. The construction of the airfield, covering 600 acres, began in 1942 and was completed in 90 days. The domestic and communal sites were dispersed in farmland to the north of the airfield. There were seven domestic sites, two mess, a communal site and sick quarters. The majority of the camp's buildings were unlined corrugated metal Nissen huts and a few permanent buildings. In cold winter weather the Nissen huts suffered from internal condensation which very often would freeze. The only heating in the huts was a round cast iron coke stove. Not the cosiest of places yet, after WW2, the huts became home to hundreds of Polish displaced persons. The camp closed in 1955/56. 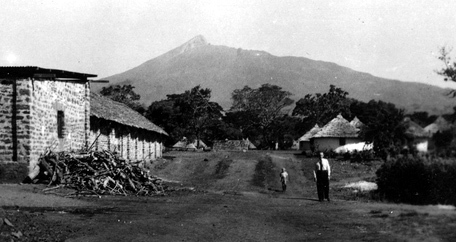 Tengeru camp with mount Meru in the backgound. I pondered my fate, because my destiny was unknown. My insecurity was magnified when I received a letter from my father in Poland telling me not to return. At that time I did not fully comprehend his letter. I felt that he wanted nothing to do with me, to never see me again. In deep despair I wrote a reply but never mailed it. Many years passed before I completely understood that, in reality, he was trying to protect me, believing that I would find a better life elsewhere, but not in Poland. One day Pani Grosicka summoned me to her office to inform me that my uncle, Julek Paterak, a demobilized soldier had registered me as a relative. Therefore, I too, was eligible to emigrate to England. Before departure I received a dress, a coat sewn from blanket cloth and other miscellaneous items. I thanked Pani Grosicka for her care and kindness and then thanked my teacher Pani Wolinska. Since my motherï¿½s death in Russia these women had been my mothers and now I was losing them. Pani Kula_ and Pani Grabowska were leaving with me, first to Arusha and then, by train, to Nairobi. After a short flight we landed in Casablanca where we refuelled, ate and rested. On the 29th of June 1948 we landed in Southampton. I reached Ludford Magna on July 9th, 1948. 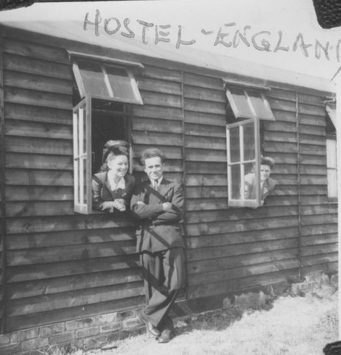 The Polish Dependantï¿½s Hostel, Ludford Magna, located between the villages of Ludford and Magna, north of Lincoln, had been a Class A air force base. These RAF pilots were replaced now with demobilized soldiers and their families. Upon arrival I received a Certificate of Registration, a document carried by all Poles and assigned a room with Marysia Iskra-Ławdor, an acquaitance from Tengeru and Pani Stoma, our cook in Tengeru. 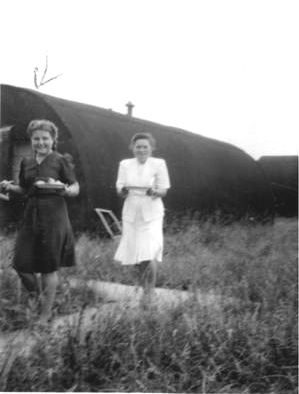 We lived in Nissen huts that resembled metal barrels half buried, horizontally, in the ground, with 2 windows and a door on the end. Being made of corrugated iron, they were hot in summer and cold in winter. We had an electric light, which was a bonus. Each hut contained 4 metal beds with straw mattresses and 4 stools with a table. Our only means of washing our hands and faces was a bucket and a basin. One of us took this bucket, summer or winter, to one of many taps scattered outside throughout the camp. We were allowed a warm shower once a week in a public bath house of which four existed in the entire camp. A short walk led to the kitchen and we ate either in the canteen or our room. The camp also had a chapel, served by Father Michalski, a building for doing laundry and a hall where movies were screened or dances held. Accommodation and food had to be paid for if you had a job. 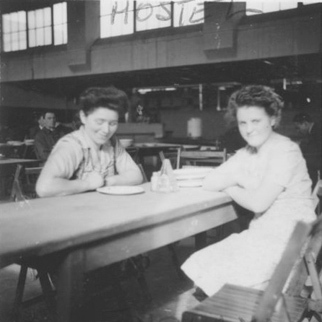 On August 12th, 1948 Marysia, who was quickly becoming a best friend, and I accepted work at Messer. J. Morrnell and G. Bardney, a canning factory in Lincoln. The work was not difficult but our days were long. Sitting on stools beside a conveyor belt we sorted the best plums for canning. We could even eat the rejected plums. When the plums were finished we sorted green peas. Our day started at 6am when we walked to the canteen for breakfast which consisted of porridge with milk, a slice of bread with butter and jam, and coffee. Before departure we received sandwiches for our noon day meal. A 45 minute drive, in a bus supplied by the factory, took us to work. We started at 8am and worked until 6pm with an hourï¿½s break at noon to eat. Then we boarded the same bus, returned about 7pm to Ludford Magna for supper and finally to our room at 8pm. Emilia Pakłos-Gągola & Maria Iskra-Ławdor in Ludford Magna. On one of the last days of August the factory organized an excursion by bus to the seaside resort of Skegness. The day was delightfully warm. After an hourï¿½s ride on the same bus we rode daily, we reached our destination. The atmosphere was electric. On the beach I saw people of many nationalities, but few people swam because the water was cold. Children filled the carousel to capacity, their laughter echoing all around. Youth and adults played the various lottery games while the town echoed with music, song and dance. More than once, Marysia and I planned our own activities, such as a movie or dancing. One day we took the bus into town for a shopping spree. Our African clothes were not suitable for life in England, so I purchased a coat and hat while Marysia bought a suit. During those first years after the war, recovery to a normal life was slow for the countries of Europe and England was no exception. We bought our new clothes with ration coupons which precisely set limits on what we could buy. One evening walking to our room after seeing a movie with Marysia, we were followed by a group of soldiers. I did not pay too much attention to them, but was conscious of them walking behind us. A short while after returning to our hut, we heard soldiersï¿½ voices again outside our door, and we were surprised when we recognized that the two standing there, had been earlier walking behind us. A knock followed, then introductions, which surprised me further. One soldier was my uncle, Janek Paterak and the other was his friend Mieczysław Wrï¿½blewski. My uncle had never mentioned in his letters that he would be visiting me, plus the last time I saw him in Russia was as a 12 year old boy and here he stood before me, a man. Their visit lasted for many hours. He listened, unimpressed, while we described our work and promised that he would arrange jobs for us in the canteen of his camp Causeway Green Hostel in Oldbury. We accepted his kindness, believing it would never happen but a short time later I received a letter from him. 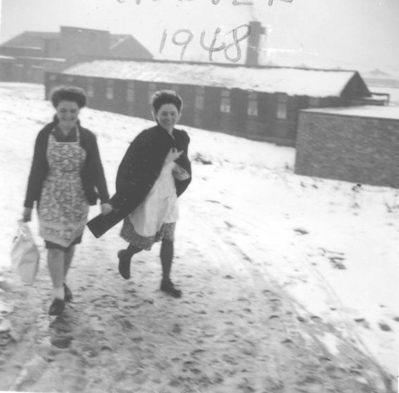 Marysia and I packed our scant belongings and arrived at Causeway Green Hostel, in Oldbury on September 8, 1948. The National Services Hostel, Causeway Green, was situated on several acres of land on the New Wolverhampton Road, a major artery connecting Birmingham with Wolverhampton. Since its neighbour was a golf course, the standing joke was that we lived in a superior location. 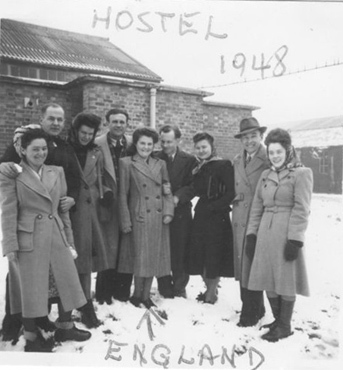 Causeway Green Hostel was the home of single men of many nationalities. The Irish, English, Germans, Ukrainians, Jamaicans, including the large majority of demobilized Polish soldiers of General Anders' army all kept each other company. Accommodation was provided for them in long wooden buildings built on a brick foundation. One entered the building through a door at the longer end, into a hallway running through to the opposite end. Ten rooms were on both sides of this hallway. Two men lived in a room. A window provided natural light when the electric light was not needed. Each room contained two beds, complete with bedding, two small wardrobes, two small dressers, a table and two chairs. The sheets were changed weekly. The bottom sheet was replaced by the top one, which was replaced by a clean sheet. At one end of the building was a common room for socializing. Guests, male or female, were not permitted in the bedrooms. Surprise searches were frequent. A large bathroom contained many bathtubs, showers, wash basins and toilets. The building was heated by hot water with radiators in every room. The kitchen and dining room were located in a large building. Upstairs was a dance hall, where dances were held every Saturday night. In one barrack lived all the women, who, like me, worked on-site. Some women were cleaners, who tidied both the menï¿½s and the womenï¿½s rooms, such as changing sheets weekly, sweeping, dusting and scrubbing the bathroom. Others, like myself, worked in the kitchen or canteen. We were paid weekly, fifty shillings, in 1949, of which, 30 shillings paid for the room and the food. With so many men of so many nationalities and religions living in one hostel, disputes were not unusual. One particularly nasty brawl occurred as the result of a Jamaican stealing an Irishmanï¿½s girlfriend. The police were notified and several men were taken to hospital suffering from injuries such as lost teeth, bruising and bloody noses. Marysia was engaged to Michał Ławdor who was the gardener at Causeway Green Hostel. Extremely happy with his job, he planted and tended the flowers and the grass, establishing new beds where needed. In October 1948 I met my future husband, Antoni Gągola, a demobilized soldier of General Andersï¿½ army, who arrived a short time earlier from the Perton Hostel. He worked at Messers Chance Bros Ltd, a glass manufacturing company in Smethwick. We always met in the common room, discussing our war experiences. As our relationship deepened we became the best of friends with my roommate and her fiancï¿½, a friendship surviving to this day. My father appears to be whispering in to my mother's ear. I believe that Mr Philips is the 1st male from the left. Men were not permitted in the womenï¿½s rooms and vice versa. Rules were strictly enforced. Breaking them meant expulsion. Rooms were checked frequently without prior notification. However rules were also meant to be broken and one beautiful spring day our fiancï¿½s paid us a visit. Before long we heard loud voices and knocking on doors, down the hallway. Our fiances quickly scrambled out the window. This event became a cherished memory. Occasionally we attended the Saturday night dances. Since the men far outnumbered the women, Marysia and I were rarely without a dance partner. Our fiancï¿½s, who could not dance, were not pleased. Women who lived outside of the hostel were frequent guests. Polish men wished to marry Polish women, yet Polish men far outnumbered the Polish women. Therefore those who had Polish girlfriends guarded them closely. I spent my first Christmas in Causeway Green Hostel with my two uncles and a friend. 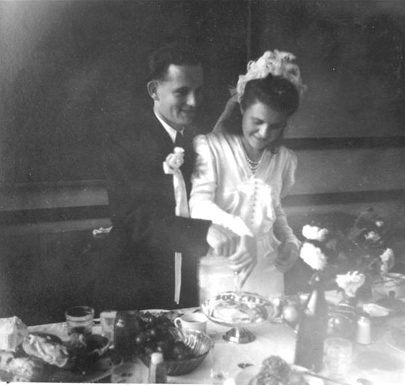 Marysia and Michał were married in April 1949. Antoni and I served as bridesmaid and groomsman. We were married in August 1949. Organizing a traditional wedding in post war England was not easy. One could not enter a shop to purchase at whim because everything from food to clothes was only available through ration coupons. People traded ration coupons amongst themselves. I would trade my tea coupons for coffee coupons with the English. Finding a room for the reception was difficult too. However my uncle found a classroom in a school that we could use for four hours. We were married at The Church of Our Lady and St. Hubert by Father Franciszek Kącki. Right beside the church was the school, with our classroom, where we celebrated with twenty-two guests, including the eight attendants. I purchased my floor-length white wedding dress with veil from an acquaintance for thirty shillings and later sold it for the same price. My bridesmaids did the same. Our meal consisted of a small glass of wine, sandwiches, tomatoes, pickles, fruit and cakes. Everything purchased with ration coupons. My brother, Henryk who was still living in Africa sent me some butter, ham and sugar. Our single layer wedding cake was baked by the cook of Causeway Green Hostel. He decorated it and wrote the Polish toast ï¿½Sto Latï¿½. 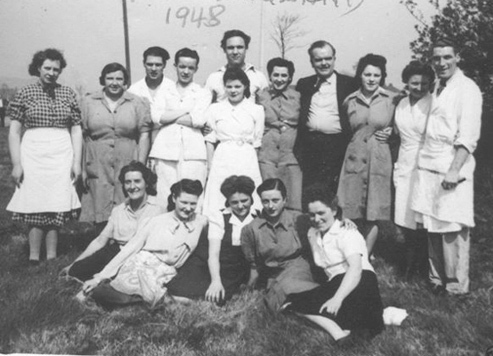 Music was provided by Emil Gągola on accordion and a lodger of Antoniï¿½s parents who played the violin. Even the chauffeur of our taxi was an invited guest. Antoniï¿½s roommate was our photographer who took and developed the pictures himself Since we were now married we were given one month to find new accommodation. 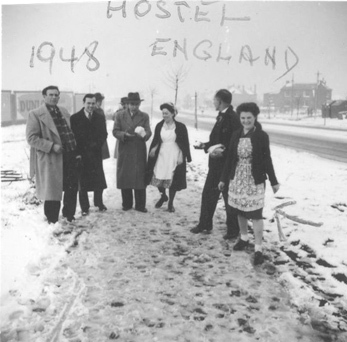 We left Causeway Green and hostel life in October 1949 for a new chapter in our lives. Photo Emilia Pakłos and Michał Gągola at their wedding. Thank you to Dorothy Gągola for the Photos and information.